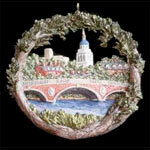 Handpainted ornament of classic Boston Landmarks by Hestia Creations. Shows the old state house, Swan Boats, Faneuil Hall, the Zakim Bridge, Prudential tower, the new Massachusetts State House. 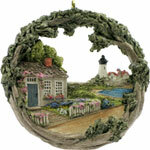 Size 3.5" diameter.